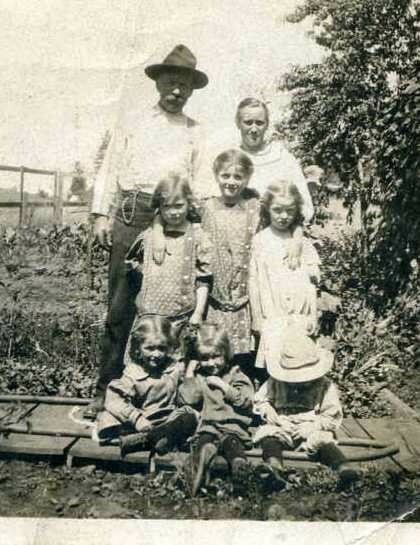 Proud Americans: The family of Anthony and Clara Davis Martell courtesy of the Lehman family tree on Ancestry.com. We family historians can never get enough of a good thing, right? So in the fall of 2012 when my son and his fiancée tied the knot I was thrilled for two very different reasons: a) my new daughter in-law was going to be an awesome addition to the family, and b) with it she was bringing an entirely new family history for exploring – a welcome relief after staring at my own brick walls for too long. Before long, I was in the thick of researching her family tree, especially those lines that would lead (where else but?) to New England. Soon enough I could see a possible Mayflower line in her grandmother’s Martell family. There seemed to be a clear path to Mayflower passenger Henry Samson. And while I wasn’t intent on signing up my new daughter-in-law for the GSMD, I knew I had to be able to prove this for my own benefit – and for any future grandchildren (wink). 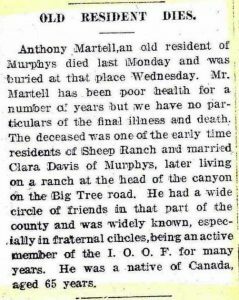 From the Calaveras Prospect, 26 July 1919. 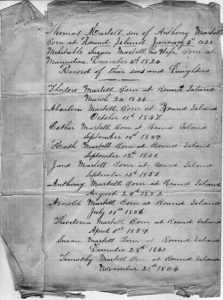 I was able to locate a date and place of birth for Anthony Martell taken from old family records that agreed with the date given in The Shurtleff Genealogy. [v] In addition to this, records on file with the Calaveras County archives show statements made by his widow Clara Davis Martell (on behalf of their children) state their father (Anthony Martell) was born in Cape Breton, Nova Scotia – possibly matching Round Island, the same community in question in Cape Breton. [vi] The county archives also holds additional unsourced records indicating the name of Anthony’s parents as Thomas and Susan Mehitable Martell – names that match the other materials. 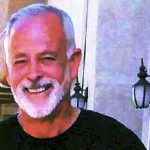 The questions that follow are: in the absence of a death certificate, what can be used to verify that this is the same Anthony Martell? Until I can perhaps locate a will, how do I tie Anthony to his parents and verify his date of birth with no other source of vital records? This appears to be a valid Mayflower line, and I wanted to be able to prove it out. 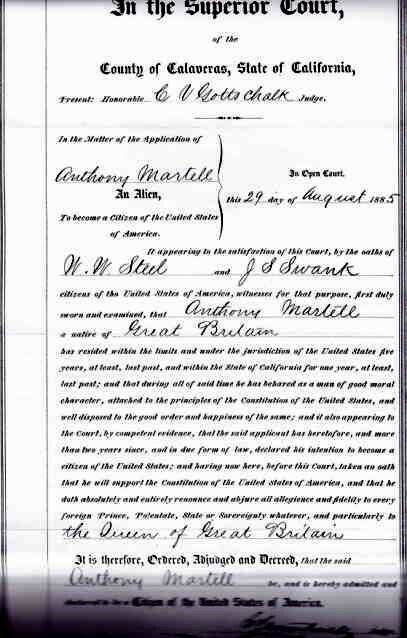 In looking for Anthony Martell, I came across his naturalization papers. For me, some of the older naturalization papers generally don’t carry a lot of information. 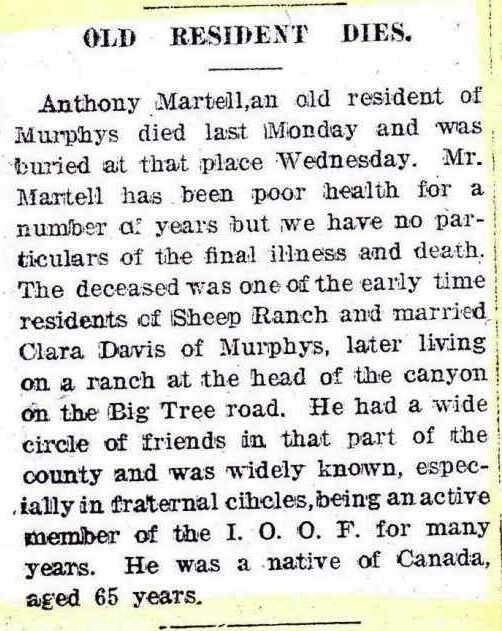 There is however one other thing on Anthony’s paperwork that significantly increases the odds that the Anthony Martell listed in the Martell family records, the Shurtleff genealogy, and the Anthony Martell buried in the Buena Vista Cemetery in Murphys, California, are all one and the same person, that being – the date he was naturalized. The date of Anthony’s naturalization was 29 August 1885. 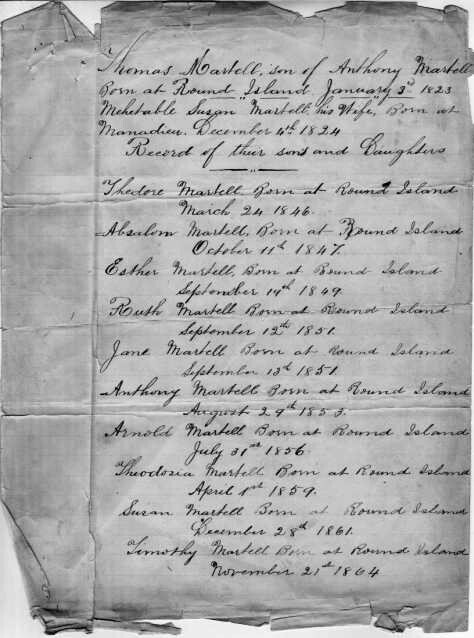 Now there could be a chance that my daughter in-law’s Anthony Martell simply chose “August 29th” as the date he wished to be naturalized, and that there was some other Anthony Martell, who was born in Cape Breton, Nova Scotia on “August 29th, 1853” and that this some other Anthony Martell never moved to Murphys, Calaveras County, California. However, in light of all of these sign posts I am thinking those odds are looking unusually thin. 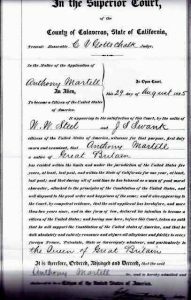 Rather, it makes sense that Anthony Martell after making his way from Canada to California, and after enduring the rigorous process of naturalization, would take the oath of American citizenship on a day that was indeed very special to him – his birthday. My son chose a wonderful woman to be his wife. I’m happy to know that I might be a little bit closer in being able to document and preserve a stronger New England heritage and a Mayflower legacy for my granddaughters and generations to come. [i] Benjamin Shurtleff, Descendants of William Shurtleff of Plymouth and Marshfield, Massachusetts (Revere, Mass., 1912), 1: 433. [ii] Calaveras County Archives, Marriage Records, Reference Book C, page 280. [iii] Calaveras Prospect, 26 July 1919; Buena Vista Cemetery, Murphys, California, findagrave.com memorial 95008600 with photograph by Ron Gott. [iv] California Department of Public Health, vital records, receipt of “ no record found,” 19 December 2016. [v] Martell family records and image courtesy of Paul Piatowski. [vi] Calaveras County Archives, Book 17 official records, affidavits of Clara Davis Martell, 14 February 1941. Great story but one quibble. Naturalization in 1885 was not a ‘rigorous process’. It was quite easy. Not til the 20th century did naturalization become more rigorous. Very cool! But VirginiaB has a good point – it is much more difficult today to become a U.S. citizen than it would have been back then. I didn’t think about a person choosing their date of naturalization and wonder if any of my immigrants did likewise. A Martell had land right next to my MacLeans in L’Ardoise, CB. In fact a Martell descendant manages the trees on my family land today. Author’s note: Some Images and information have been supplied to me through Martell family cousin “Paul Piatkowski” – I have spelled his surname incorrectly in the above post – this is at no fault to Vita Brevis, or to AmericanAncestors.org – but my error alone.